OCG Studios - we develop amazing and beautiful apps. Each page was analyzed; after that we could start working on dissecting the book digitally. For this “Making of…” we took the train page as an example. First we’ll show you the original page. We wanted to give the book depth, whereby you can move your ipad and you see different sides of the train. We wanted to animate certain things, and we wanted the doors to open and close. 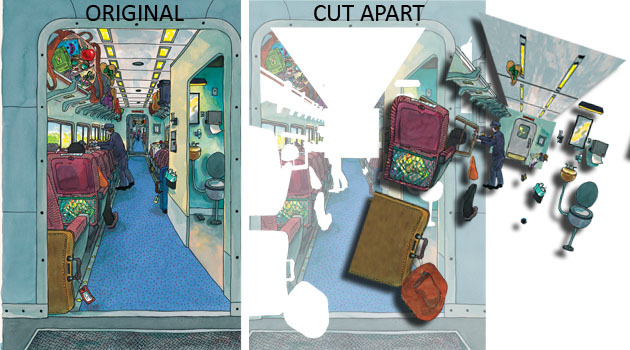 On the next image you can see the train page in pieces; each gap has to to be filled in digitally or redrawn by Roxie. When each and every item was taken out and put in different PhotoShop layers, we could start putting things back together. Since we wanted to be able to move from left to right and from top to bottom, we had to draw much more than was in the original book. When we took a person out of the original drawing, we had to recreate them back into the image. Choosing Ebooks, Ibooks or Apps!